In the summer of 2012 I went to visit the Bialowieza Forest in Poland which is the largest remaining part of the vast primeval forest that used to cover Europe. It is now protected by various legislations and is a wild unmanaged woodland with restricted access so it is a haven for wildlife. We saw bison and elk and deer, so many birds and one day a snake. 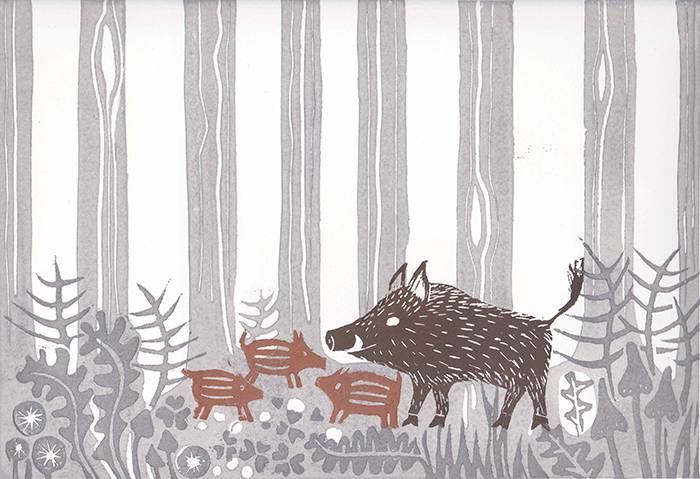 And every day we went out into the Forest we saw boar. Or heard them. Or smelt them. The first one we saw was a mother with 3 babies which we managed to see for a while before she saw us. When I got home I thought I would make a lino print of her.